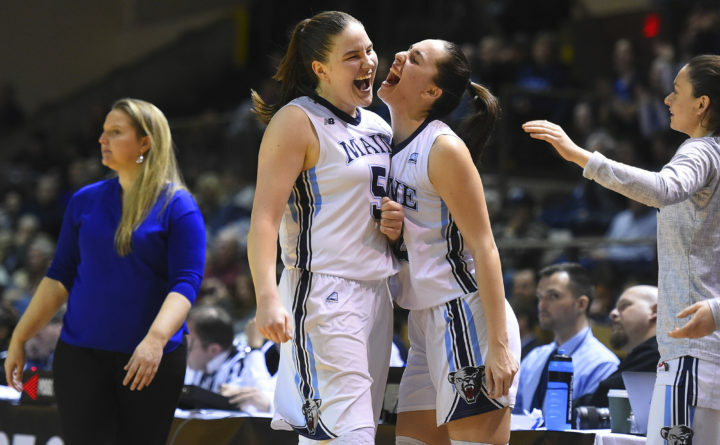 Fanny Wadling (left) and Blanca Millan of the University of Maine share a celebratory chest bump as the Black Bears closed in on the end of their 64-48 America East semifinal victory over the University of New Hampshire in this March 4, 2018, file photo. Stonehill College has faced the University of Maine women’s basketball team in exhibition games the past three seasons, including last Saturday’s 85-46 setback to the Black Bears. Veteran Stonehill head coach Trisha Brown said this year’s UMaine team is the best of the three. The Black Bears return four of five starters off last year’s 23-10 team that captured its first America East tournament title since 2004. UMaine lost to nationally ranked Texas 83-54 in the NCAA tournament in Austin, Texas. Guards Blanca Millan (first team), Tanesha Sutton (second team) and Dor Saar (Rookie of the Year) earned all-league honors. The other returning starter is 6-foot-1 junior forward Fanny Wadling from Sweden. “It is our best team, by far, because everybody works really hard and everybody wants to be here, said Millan, referring to how five players transferred from UMaine following the 2016-17 season. Millan, Sutton, Saar and Wadling, along with fifth-year senior guard Parise Rossignol of Van Buren, give UMaine a formidable starting unit. “Our guard play was our strength, but we also need the guards to be active when it comes to taking the ball to the basket,” said UMaine head coach Amy Vachon, the AE coach of the year. The Black Bears shot 111 fewer free throws than their opponents last winter. “We have a lot of great [outside] shooters but if [opposing defenders] come charging out at us, we have to take advantage of that and look to attack [the basket],” Sutton said. Millan said the team is spending a lot of practice time on free-throw shooting. The Black Bears should again be a stingy defensive unit after finishing 24th in the country a year ago, allowing only 56.6 points per game. An inexperienced supporting cast will dictate how dominant the team can be in the conference and how far it will go. Millan, Sutton, Saar, Wadling and Rossignol are the only returnees who averaged more than 6.8 minutes of playing time. “They know they’re going to have to step up for the team, and they’re really working hard every day,” Millan said. UMaine, which also won the league regular-season title after being picked sixth in the preseason coaches poll, was a unanimous selection to repeat as conference champ in this year’s preseason poll. The 6-1 Millan, the tournament’s Most Outstanding Player, averaged 17.5 points, 5.1 rebounds, 3 steals and 1.6 assists per game, and was selected to the All-Defensive team. She led the conference and ranked 13th in the country in steals. She was second in the conference in scoring average and third in 3-point percentage (.354). The native of Santiago de Compostela, Spain, is a difference-maker at both ends of the court. “She is definitely a special player,” said Vachon, who stressed that Millan’s point production won’t dictate the type of season she is having. “The deciding factor will be how efficient she is and how she makes the team better,” Vachon said. The 5-10 Sutton (12.1 ppg, team-high 6.9 rpg) is a fearless rebounder with terrific instincts. Her 2.93 assists per game led the team, and she was fourth in the league in shooting percentage (.492). “She needs to be more selfish. We have to get her to look to shoot before passing,” Vachon said. Israeli sophomore Saar (5-6) proved to be the consummate point guard and ran the offense like a polished veteran. She averaged 5.6 points, 2.3 rebounds and 2.91 assists, and hit 33.7 percent of her 3-pointers. Vachon wants Saar to become more of a scoring threat and said she has improved her defense. Wadling was the team’s second-leading rebounder (5.6 rpg) and averaged 6.4 points and 1.9 assists. “She brings it every day. She works her tail off,” Vachon said. Wadling can score inside and is capable of hitting mid-range jumpers. The only other experienced returnee is the 5-8 Rossignol, who won the America East Sixth Player Award, and averaged 5.4 points and 2.1 rebounds in 21.3 minutes per game. She was an America East All-Tournament pick. Rossignol, the state’s No. 2 all-time leading high school scorer with 2,589 points, will be one of the players counted on to fill the void left by the departure of 3-point specialist Julie Brosseau (11.3 ppg, 34.7 percent from the 3-point arc), who transferred to the University of Utah. The rest of the team is a giant question mark. Vachon said junior point guard Maddy McVicar of Calais is, arguably, the most athletic kid on the team. “Turnovers have hurt her in the past, and if she can get that under control, she can do a lot of good things for us,” Vachon said. Five-foot-11 Maeve Carroll, 6-3 Kira Barra and 6-5 Kat Williams, all sophomores, saw limited service a year ago but have shown significant improvement and could supply UMaine with a useful inside presence. Sophomore Kelly Fogarty, a 5-9 guard, made a school-record 245 3-pointers at Walpole (Massachusetts) High School and could be another valuable outside shooter. Junior guard Sierra Tapley Bar Harbor is an influential locker room presence and a great teammate, according to Vachon. Tapley can be a productive shooter. The two newcomers are 5-11 Turkish guard Doga Alper, who won’t be eligible until at least the second semester, and 6-2 Slovakian forward Alex Bolozova. UMaine again be challenged by a grueling nonconference schedule that features three NCAA tournament teams in Sweet 16 entries Duke (24-9) and North Carolina State (26-9) along with Wisconsin-Green Bay (29-4), which lost in the first round. Duke is coached by former UMaine head coach Joanne P. McCallie. UMaine opens the season at 1 p.m. Saturday against Toledo at the Cross Insurance Center in Bangor.